Hello Friends!! Happy Tuesday!! I have the tutorial that I promised you on my last Really Reasonable Ribbon Post. Here is another look at the Journal I did using the Big Bitty Bags. The tutorial will show you how to create the basic journal / mini album. I usedthe new Jumbo leaves, Juliet Lace, green leaves, pink crochet lace, champagne ribbon, cotton candy baker's twine, three brown buttons, aqua shimmer satin and Big bitty bags to create my journal. So...grab yourself your favorite beverage and a snack and get comfy while you watch my tutorial here. I created a collage sheet which you can purchase in my Etsy, which will allow you to create both gift card holders and two tags. On this holder I used the moss green leaves Juliet lace cotton candy baker's twine, I tied it with the Moss green Gingham ribbon. Here is the other gift card holder from the collage sheet. I decided to go "vertical" with this one. On this one I used the same leaves, large pink crochet lace (most of it is hidden), cotton candy baker's twine and mocha button (love the flower shape)! Here are the same gift card holders done another way (I did these on Sunday). I used the Parrot green leaves and red diagonal ribbon on this one. Another vertical one. This one was tied with the Champagne organza. Today I had a little time to create some gift card holders so I can participate in Sandi's Christmas in the Bank Challenge. She has made some easy peasy gift card holders, and has shared how to create them on her blog. I was inspired and created these Vintage Christmas Gift Card holders below. I printed then cut out all my images, distressed with Vintage Photo distress ink by Ranger, then used pop dots to elevate the sentiment, so that the ribbon easily slides under it, so the gift card holder can be tied shut. I found a Vintage image of Santa and added him to the background that I designed and added the "Merry Christmas" sentiment. 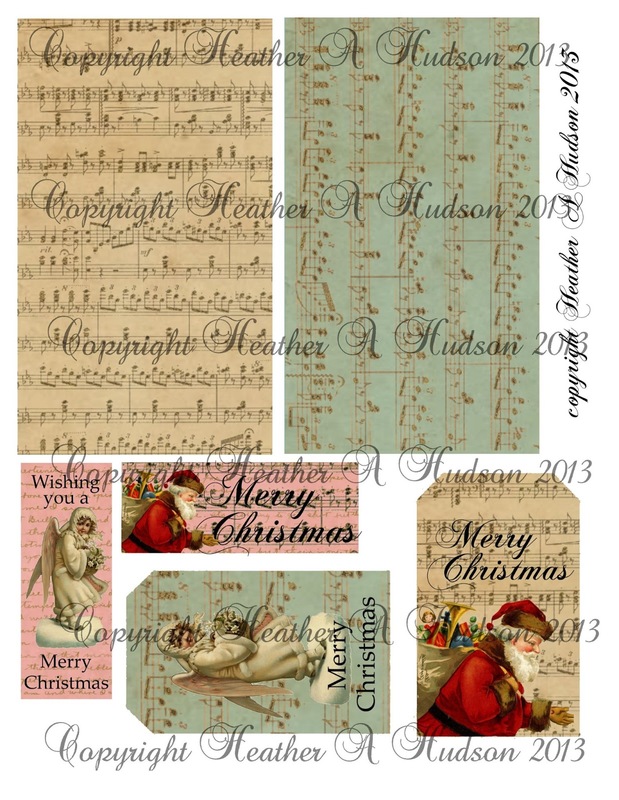 After I printed it out, I decided that I didn't like the music notes behind the "Merry Christmas," so on the collage sheet the pink background will just have the gold writing. One of the notes makes it look like I have added an extra letter "i" to Christmas...LOL. But it is the letter "m." That is the reason the music notes will be gone (so if you purchase the collage sheet you will understand). I have my favorite Champagne Flatback pearls and red blingy bling mesh, and ivory drop bead pearls all from Pro 31 designs. I also used my favorite Juliet Lace, parrot leaves and red diagonal lace from Really Reasonable Ribbon. On the gift card holder below I used some of the Pink crochet lace and champagne sheer organza. This one I decided to go "Vertical." Add a little interest in my Gift card holders. This way I could use the sweet image that I found at the Graphic Fairy. If you missed Sandi's first Christmas in the bank challenge, which was to create 12 tags, this collage sheet can help in that I included to easy tags as well. You can purchase the sheet in my Etsy shop here. I hope to have some time to create a few more this week, so please plan on stopping by again for another visit! I hope you have some time to play along in Sandi's Christmas in the Bank Challenge!! It is week 50 at Sugar Creek Hollow, and our theme this week is "Vintage hats, shoes and purses," we would like to see you use one or more of these items in your vintage or shabby chic style creations. Before I forget, we have a guest designer, Brenda, and I would love it if you popped on over to her blog and left her some love! As always the rest of the DT has some fabulous inspiration, so pop on over and visit them as well. I used the Gecko Galz Bits and Pieces collage sheets to create these gift card holders. I got the idea from my girlfriend Sandi. She has this wonderful idea of a challenge that we will all benefit from called Christmas in the Bank. This month, she showed how to make some easy Christmas gift card holders (you can get the measurements and "how to" on her blog). I loved them so much, I decided to create some Vintage Shoe Birthday Gift card holders (you never know when you may need a fabby gift card holder). I created the background papers and "Happy Birthday" sentiments in GIMP. They were printed and cut out, and inked with Ranger's Vintage Photo. Then I embellished them with some ribbon and trims from Really Reasonable Ribbon. I used the pink crochet lace, Juliet lace, moss green leaves, pink diagonal ribbon to give a great vintage feel to this gift card holder. The Vintage shoe on this one is my favorite! I used the Candi foam fix it pads to elevate the sentiment, so I could tuck the ribbon under to tie the piece closed. On this one, I used the Champagne organza, gold pom pom trim, another pink crochet lace as well as the moss green leaves and Juliet lace. I even added a tiny button from the Latte collection and some cotton candy baker's twine. I hope you enjoyed my creations!! Sugar Creek Hollow this week! Hello Friends!! Happy Monday! It is my turn to give you a little inspiration over on the Really Reasonable Ribbon Blog. Before I get going, I wanted to mention that Bonnie is having a sale going on right now! President's Weekend Sale!! You really need to check it out. Here is the project I would like to share with you today. This is a Garden theme mini album journal that I have created. I used some fabulous ribbons and trims from Really Reasonable Ribbon. The new Jumbo leaves, Juliet Lace, green leaves, pink crochet lace, champagne ribbon, cotton candy baker's twine, three brown buttons, aqua shimmer satin and Big bitty bags....really make this album beautiful...at least I think so...LOL. I used the candi fix it foam to elevate my beautiful "Bird of a Feather" images. The digital paper that I punched is also from Gecko Galz. The images with the bags ribbons and trims...gives this journal a very vintage shabby chic style...which everyone knows is my favorite. Here are some more close up below. So if you are interested in seeing how my inside pages and tags turned out, you will have to come back and visit me on Tuesday February 26th, for my next post. I originally planned this tutorial for that date, but since Bonnie has such a great sale going on, I thought I would post a teaser now :0). So...head over to the RRR store, and do a little shopping. It is week 49 at Sugar Creek Hollow, and our theme this week is "Metal Mania" we would like to see you use some metal in your vintage or shabby chic style creations. I thought I would create an Easel Card, here it is below. I used a Collage sheet that I designed for Gecko Galz. Here are some close ups. I found a cute little metal heart charm that I tied a piece of aqua baker's twine to create a little bow. I distressed the edges with ranger's vintage photo distress inks. You can see the old gold diamond ribbon tucked in on the right. The pink leaves and Juliet Lace, peek out behind the pink rose. I used the Candi Fix it foam pads to elevate my sentiment, embellished it with some more pink leaves, Juliet lace, vintage buttons, pink and white diagonal ribbon, and cotton candy baker's twine. I added some of my favorite Champagne pearls too. I used one of my favorite punches from Martha Stewart for the paper peeking out of the top, adds a nice soft dainty touch. I can't wait to see your shabby and or vintage style creations over at Sugar Creek Hollow. If you use spring colors and some ribbon, you can play along with the Really Reasonable Ribbon Challenge as well!! What a LOVELY assortment for Spring projects!! I thought I would make a Card. I cut out all my pieces, and sentiments. Inked the edges with Ranger's Vintage Photo distress inks. Used my glue gun and candi fix it foam pads to attach my embellishments. I am happy with how my card turned out! You will see I used the Blue polka dot big bitty bag. I folded it in half, to create two pockets, so it looks like a card. Inside the front and the back pocket are two Easter Egg Ornaments I created in Gimp. Actually I created a collage sheet, so these images are part of it. You will be able to purchase it in March at Gecko Galz. Here is a great close up of the Juliet lace, Pink crochet lace, pink diagonal ribbon. The Green, turquoise with white diamonds and Double Pink ribbon are from this month's ribbon assortment! I have also used some other goodies from Really Reasonable Ribbon. Newsprint candis, the purple and turquoise ribbons from this month's assortment. The pearls and vintage button are from my stash. Here is a look at the back. I didn't ink the turquoise ribbon, since it would be handled a lot. I just love this month's ribbon assortment, and I hope that you have been inspired to create some fabulous projects! It is week 48 at Sugar Creek Hollow, and this week we would like to see you create with "Feathers or Fur" meaning we would like to see birds or animals in your vintage or shabby chic style creations. Here is a picture of my project below. The original image is one from the graphic fairy, I just altered it a tad. I distressed the edges with my kraft knife and ranger's vintage photo distress inks. I also inked the Newsprint candis...that are elevated with Fix it foam pads. You can see the old gold diamond ribbon as well as the moss leaves peeking out. I embossed my tag with an embossing folder and inked it with worn lipstick and barn door distress inks...as well as Vintage photo all by ranger. I love the champagne organza bow, juliet lace and the ribbon and leaves! So soft..and shabby!! I chose to top off my tag with the diagonal pink and white striped ribbon from Really Reasonable Ribbon. I love it! Hello Friends!! Happy Thursday!! I have a tag that I created that I would like to share with you today. I was inspired to create this tag by visiting Sugar Lump Studios. I found this darling image at the Graphic Fairy. I created a collage sheet, printed it out..and this is what I came up with. I loved how it turned out, except that the cream color (you know how a color looks one way on your computer...but another in real life...lol) ended up being more yellow looking...so I did go back and change that. (so the next set will be more to my liking) I cut out all my pieces, inked them with Ranger's Vintage Photo, and then put my tag together. I used one of my lacey border punches with the music and writing strip of my collage sheet to create the piece going across the top of my tag. Kind of hard to see all my pieces...tend to cover them up...LOL Here are some close ups. I love the seam binding, brown diagonal ribbon, the brown sugar baker's twine, and Juliet Lace all from Really Reasonable Ribbon! Isn't this image just darling? I distressed the edges with my kraft knife, then inked them with Vintage Photo distress ink by Ranger. I used the Candi fix it foam pads from Really Reasonable Ribbon to elevate my text boxes and image. You can find my collage sheet in my etsy. 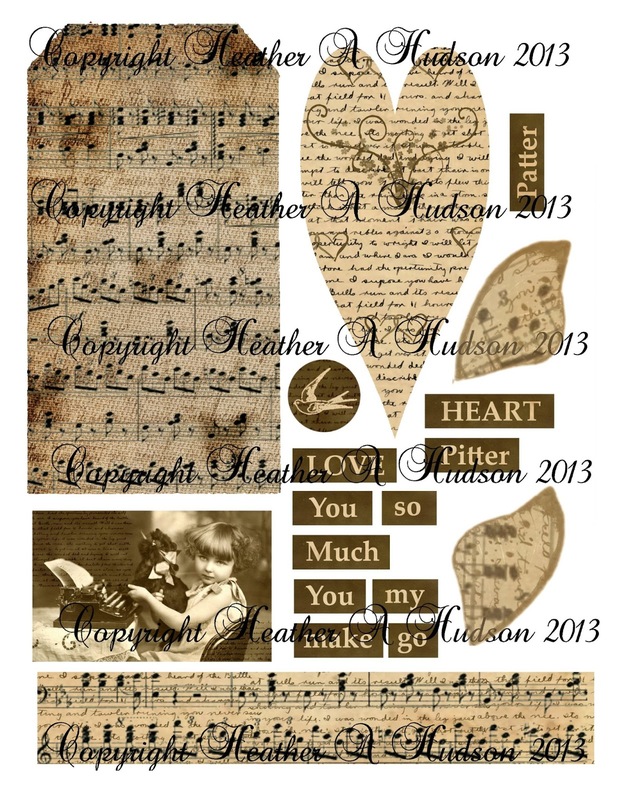 Sugar Lumps Studio, so please stop by and see what her 14 Hearts is all about, and link up your creations! Here is the inspiration photo from the tea room. The challenge is called "Cute as a Button." 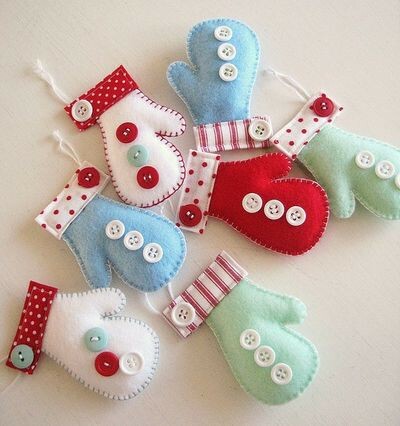 OMG...these little mittens are cute as a button!! Here is my creation. I found a cute image online, when I saw it I instantly thought of another one of my blogging buddies Shawn at Poetry in a pot of tea. She knows everything about tea, so please check out her blog, she has lots of fun posts for you to enjoy. I created the background paper, red polkadot paper and edited the image in GIMP. Which is a FREE online program, similar to photoshop elements. I have FREE tutorials on how to use it. You can see all my tutorials on my Youtube here. Here is the collage sheet below. You can purchase it in my Etsy for $2.50. 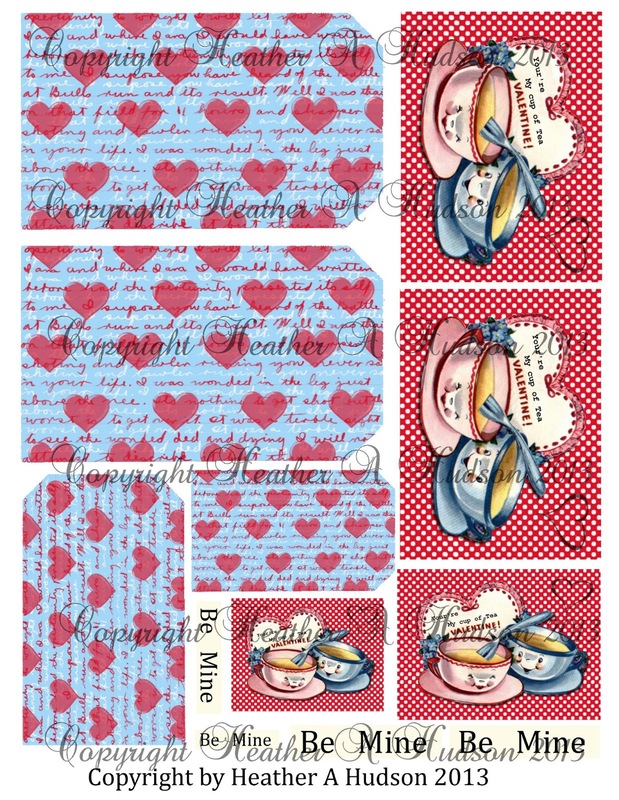 You will be able to create 4 tags with this collage sheet, 2 large, 1 med and 1 small. Here are some photos of the finished tags below. Above is a close up of one of the large and the medium tags. Below is the other large tag. Here is the cute little tag. Here are some fun close ups of all the fabulous Ribbons and trims I used from Really Reasonable Ribbon. I love the red and white diagonal ribbon I used for the tag top above. Peppermint baker's twine, white lace from the "Easter Egg Assortment," vintage buttons and red bling add to the vintage retro feel of my tags. Above you see more of the peppermint baker's twine, white lace, red leaves and pink polka dots grossgrain ribbon and below is a great close up of the red pom pom trim, and blue with white stars ribbon. One last close up below. I really love this blue ribbon with the stars from the Easter Egg Assortment. I inked it with Ranger's Vintage Photo...and it is the perfect Robin's egg blue...gorgeous!! I hope you enjoy my tags!! You can see them in my Youtube video here. I will be linking up with the following challenges.